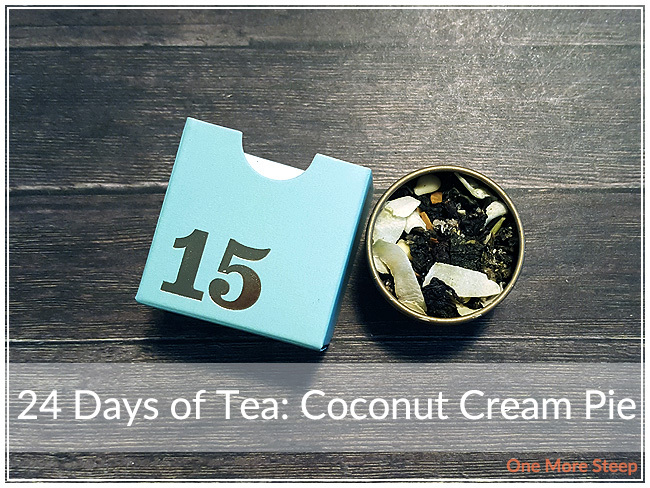 Mmm, day 15 of the 24 Days of Tea advent calendar is Coconut Cream Pie! I was expecting with a name like that it would be an herbal/fruit infusion, but Coconut Cream Pie is surprisingly an oolong tea. There’s a delightfully strong coconut smell to this dry tea, it smells exactly like it’s namesake and the oolong base is kind of lost in the mix with the strong flavours that they’ve added to it. 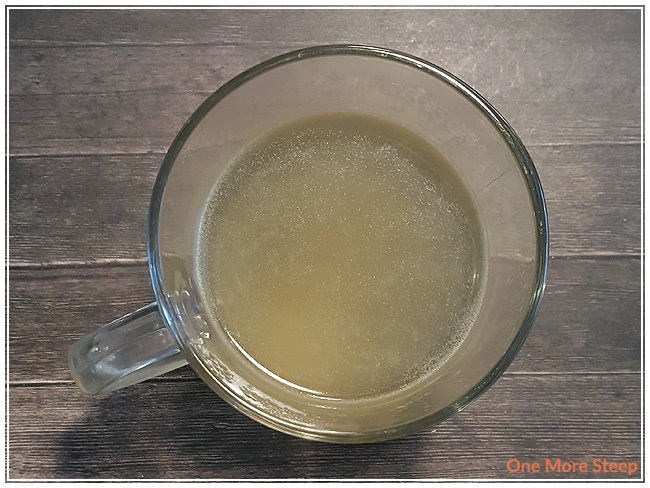 It’s easy to see both the tea leaves and the coconut, chocolate, and everything else that has been added to this tea. Coconut Cream Pie is made up of: oolong tea, white chocolate, coconut, toasted coconut, cane sugar, and natural coconut flavouring. The allergens in this tea are: coconut, milk, and soy (soy is in the white chocolate). DavidsTea recommends steeping Coconut Cream Pie in hot water (75-80°C/167-176°F) for 4 to 7 minutes. I don’t usually steep oolongs for that long, so I opted for closer to 3 minutes but found that the white chocolate hadn’t fully melted (it took a full 4 minutes in 80°C water for the white chocolate to completely melt). Coconut Cream Pie steeps to a nice yellow colour, with an oily film on top from the melted chocolate. 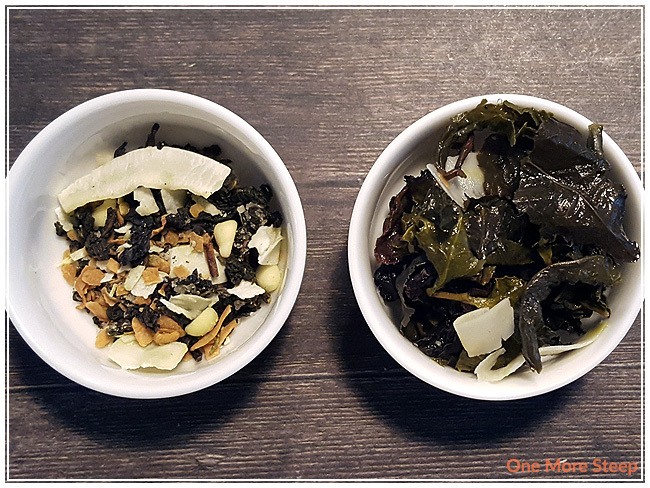 The strong fragrance of the coconut is subdued after the tea has steeped, and the oolong base starts to take over as it is much stronger now that it has been steeped. There is an oily mouthfeel to this tea, which I anticipated from the white chocolate chips that I saw in the mix. The cane sugar adds a good amount of sweetness to the tea, but it does need a little bit more to help out the flavour. The tea lacks a certain creaminess that I was expecting, because of the namesake of the tea, and the coconut taste is milder than expected. However, there is a nice buttery quality to it that does add a certain sense of cream taste to it, so not all is lost. I’m not sure where the aftertaste comes from, but there’s just a slight hint of a bitter aftertaste to this tea from each sip. It’s not the usual ‘you oversteeped your tea and this is your punishment’ aftertaste though, so I’m not quite sure where it comes from. As an aside, it always makes me smile to see how much oolong can expand and unfurl. Oolongs are definitely teas that deserve to have a whole tea pot to fill up, or metal infuser, versus being put into a tea bag. I resteeped Coconut Cream Pie just once, the odd bitter aftertaste persists, and the oolong has a nice buttery quality to it that adds more of a creamy flavour to the tea itself. Sadly, the coconut flavouring gets weaker on the second steep so I would say that Coconut Cream Pie is good for one steep only. 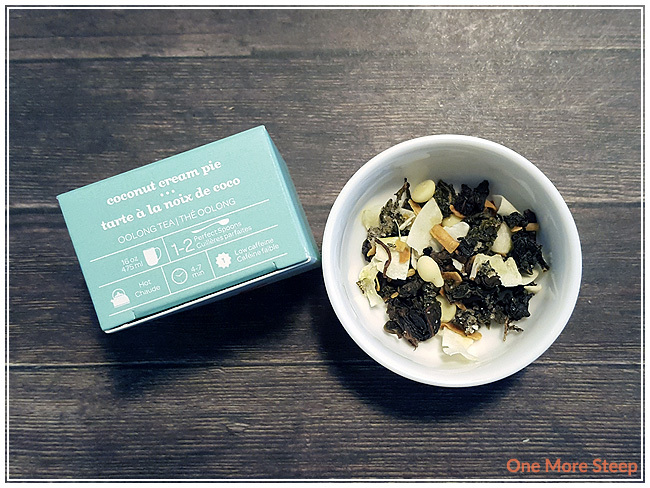 I didn’t like DavidsTea’s Coconut Cream Pie. There was just something ‘off’ about this tea for me, with the lack of creaminess to the tea and the weird bitter aftertaste. This tea may taste better as a latte, I think, because the added dairy (or non-dairy milk) would add some much needed creaminess. A little bit of sweetener wouldn’t hurt either, to help boost the sweet coconut flavour a bit as well.